OLLANTA HUMALA TASSO, President of Peru, strongly denounced the terrorist attack in Nairobi, before drawing attention to the crisis in Syria. 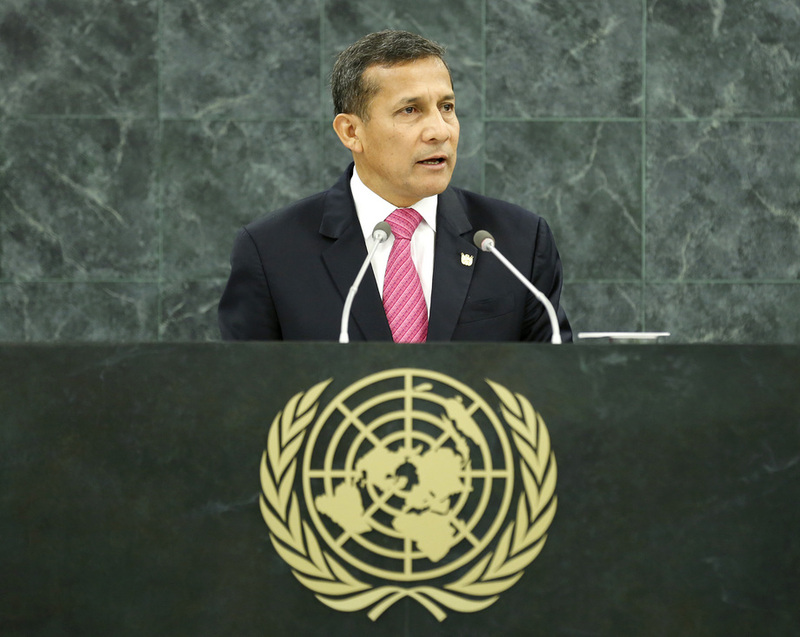 Peru condemned the use of chemical weapons, he said, calling on the Security Council to uphold its responsibilities. He urged the international community to maintain the global commitment to develop peaceful relations among people, such as Peru’s recent cooperative management of the maritime delimitation dispute with Chile. However, the main threats to international peace and security did not lie in relations between States, but rather in terrorism, drug trafficking, organized crime, mafias, and corruption. “All these crimes pose a real threat to life, progress and development, mainly affecting the poor,” he said. In light of those and other challenges, he welcomed the theme of the sixty-eighth General Assembly session, especially in relation to the target date for achieving the Millennium Development Goals. Peru had been among those with the best compliance indicators, particularly in the fight against poverty, hunger, child mortality, and access to safe drinking water. In 2000, more than half of the Peruvians had lived in extreme poverty, whereas in 2013, that number dropped to a quarter. He announced that the goal was to reduce poverty to one fifth by 2016. Focusing on Peru’s growth, he underlined the emphasis placed on inclusion, as “in an unprecedented way, expenditure is directed towards the poorest and most excluded, through a set of social programmes.” The global development agenda must place particular attention on women’s empowerment and the protection of the most vulnerable, such as indigenous peoples. Peru had been the first country in the world to have legislated the right to prior consultation on measures that directly affected those peoples, in accordance with International Labour Organization (ILO) Convention No. 169. He stressed the country’s concern for migrants’ rights, in favour of the free movement of people. He welcomed the Spanish initiative to promote visa-free entry into the Schengen area for Peruvian nationals. On the post-2015 development agenda, he said the process should lead to greater capacity of the United Nations to contribute to solving urgent problems and development challenges, thus evolving a single and comprehensive development agenda. The quest for equality should be central to those efforts. Growth should not be an end in itself, but, rather, a tool. That was why Peru believed that the correct formula was “include to grow”, which was the direction the country proposed for the post-2015 agenda. Turning to the economy, he said that Peru had been among the fastest growing countries, which had led to job creation, unemployment reduction, diversification of the economy, and development of the tourism sector. He underlined that Peru’s economic growth had been the result of effort, rigour, work, democratic continuity, and perseverance. Peru not only had managed to avoid the worst effects of global instability but had attracted investment flows unparalleled in the country’s history. Its task was to sustain the foundations that had enabled that growth, namely strengthening democracy, institutions, rule of law, security, building citizenship, and opening spaces for participation. Peru possessed the means to achieve that, as it was a “country of entrepreneurs”, where 98 per cent of businesses were small or medium, employing 75 per cent of the economically active population and contributing 42 per cent of the gross domestic product (GDP).